Maison Delamotte, one of the region’s oldest producers, has been a benchmark in Champagne since 1760. 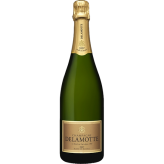 Delamotte is sister house to the legendary Salon, the latter a super-premium Blanc de Blancs made from a single one hectare vineyard in Le Mesnil, plus grapes sourced from 20 other Grand Cru vineyards in the area. The house is a favourite for its consistent quality and unflagging respect for the terroir and the surrounding Côte des Blancs. Delamotte is Champagne for the hedonist, an esoteric yet joyful pleasure. This is generally considered to be a Champagne for those “in the know”, although it is one of the region’s very best. A true hidden gem. Le Mesnil-sur-Oger, Avize and Oger are home to vineyards where Chardonnay lights up the landscape. This delicate variety meets striking terroir in the Côte des Blancs to produce wines that remain fresh and intact over time. Light, gossamer-textured, impertinent, more complex with ageing, discrete yet present, heady but not heavy.